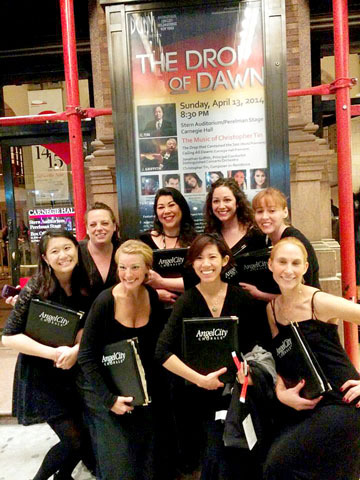 LIVE AT CARNEGIE HALL: (clockwise from the back row on the left): Kerry Menchin, Zarina Silverman, Lauren Grigsby, Camie Staggs, Tina Mitro, Shaiya Rahman, Kimberly Ann Gallagher, and Sandra Chiang. Shaiya Rahman found Angel City Chorale through a Google search three seasons ago, and has been singing ever since. She is busy rehearsing for the group’s spring concert: “Elements” on Sat., June 7 and Sun., June 8 at 7 p.m. at the Wilshire United Methodist Church, 4350 Wilshire Blvd. The classical/world music fusion work is sung in multiple languages by the 160-member choir as well as guest artists. ACC founder and artistic director Sue Fink conducts. The chorale recently premiered the work at Carnegie Hall and in studio for a recording of a new CD. A variety of musical styles are also on the program, including pop, classical and spirituals, some in Old Norse, Mongolian, Bulgarian, and even Xhosa (known as the “click language” from Africa), says Shaiya. The Hancock Park resident adds the diversity of the chorale suits her: she is half Japanese, grew up in Singapore, has classical European vocal training and professional experience in musical theater. Tickets are $30/$35 at the door, with discounts for children and seniors.